Beautiful and correctly outlined the shape of the eyebrows gives the girls charm and unique charm, make eyes more expressive and open. Therefore, you should regularly adjust the eyebrows and remove excess hair. To start, gather your hair and get under the bandage so that the bangs did not fall on the eyes. Rinse all cosmetics off the face, prepare the mirror and the tweezers with beveled edges, which must be disinfected in an alcohol solution. To adjust the eyebrows should be in the evening or on a weekend when you do not need to leave your home. To ease the process and make it less painful, make a nourishing mask on the eyebrows: slightly heat the almond butter and moisten cosmetic discs, apply on the eyebrows and leave it on for fifteen minutes. After this process is practically painless and won't leave red marks. To determine the perfect shape of your eyebrows, apply a pencil vertically to the corner of the eye and the wing of nose. The beginning is at the intersection of the pencil with browney line, a distance of approximately one centimeter from the inner corner of the eye to the nose. 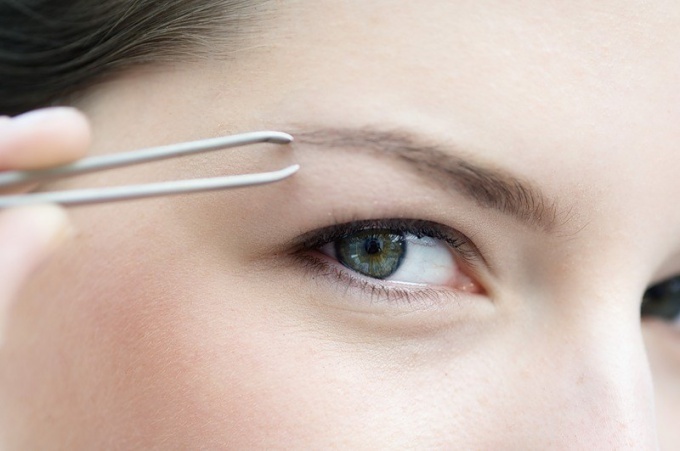 All the hairs close to the nose – unnecessary, remove them with tweezers. Arched eyebrows make the nose longer and visually closer to the eye. Pull out the hairs one by one (do not take the tweezers several pieces), fast and sharp movements in the direction of growth, i.e. to the temple. Every hair grab closer to the base. To determine the bend point, place the pencil from the wing of the nose through the pupil of the eye. The intersection of the pencil and the eyebrow defines the highest point. After the brow should gently descend to the temple and to narrow. To determine the end of the eyebrow ground the wing of the nose, outer corner of the eye pencil. The intersection of the pencil and browney line will be the end point of the eyebrow. Carefully remove all the excess hairs on the bottom edge. When you have removed all the excess hairs, take a look in the mirror and make sure that the eyebrows are adjusted equally. If there is redness and a little swelling, treat skin with a cotton swab dipped in witch hazel extract, which has anesthetic and antiseptic properties.